This special 50th Birthday Party edition of The Shack begins at 7pm and will go on 'til late! 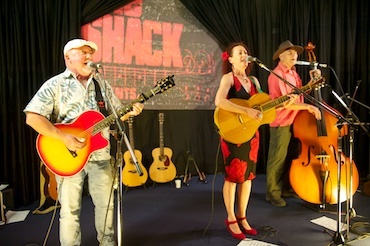 New York Public Library - John Flannigan (“Flano”), Warren Boyd and Isabelle Fogarty are the New York Public Library, a lively, popular, and thoroughly entertaining trio who have been an icon of the Sydney folk scene for years, having begun their career at the original Shack. 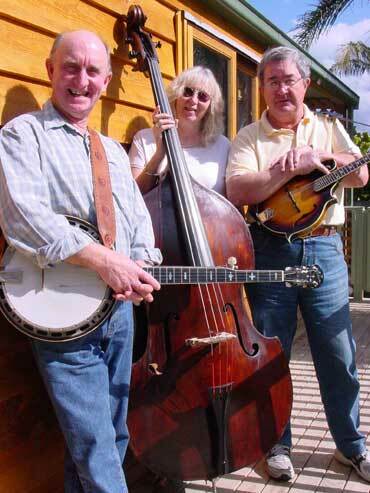 They play a variety of music including originals, folk, comedic and something they call “adapted bluegrass”. Grimick - An honest, acoustic, folk-rock style, Grimick are an energetic group of singer/song-writers who never stray far from the essential ingredients - great rhythm, a contagious melody, and something to say….With seemingly no upward limit to their vocal range, they are capable of both power and tenderness, humour and passion. Combine this with ripping guitar riffs and solos, smooth harmonies, earthy percussive rhythms and arrangements on conga, trumpet, ukulele and piano – and you have a special live act not to be missed. Dave Calandra plays guitar like his life depends on it…. and he also writes a fine tune, the kind of songs that dwell in your subconscious for days at a time. His rugged vocals, fluid guitar style and haunting songwriting have been aptly described by industry veterans as sounding like Mark Knopfler and Kelly Joe Phelps covering the works of J.J. Cale. Jim Jarvis - An excellent solo performer well known for his distinctive, haunting blues voice and his finger-picking guitar style, Jim is highly respected among a host of other musicians. 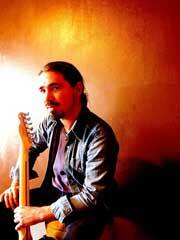 He has a polish and finesse that is characteristic of a fine, traditional and world class blues musician. Jim has been in the parlour blues scene in and around Sydney and the Blue Mountains over the years, playing at various folk clubs, pubs, radio shows, cafes, festivals, parties, house concerts, etc. He is well-known for his song “Ballad of Balmain” with its most beautiful melody that he co-wrote with Ian Jane. He has performed with Last Bus (with Gerry Gillespie and Dave White), Rent Party (with the late Earlwood Greg Derrig and late Trevor Winn), Hokum-On-Somble (the iconic Sydney-based jug band, with Peter Deane Butcher, Al Ward and Alan Meadows), The Other Brothers and Duck Soup (with Alan Meadows, Al Ward and Tony Burkys). Jim has been a long-time member of Three Left Feet. Myd Lyfe Crysys is the Shack’s resident band, all having hailed from the early Shack. They have all been in various bands over the years and play a lively mix of Jug Band, Blues and Roots with strong vocals of Andy George and Rhonda Mawer and Andy’s talented guitar playing, Graham Vick on vocals and double bass. They liven up the place with their good time music and irreverent take on the world.